Management Mentoring – when you need to build your confidence in delivering a solution. 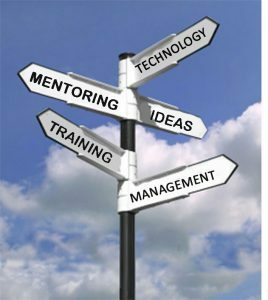 Technical Mentoring – when you need to build better rapport with your IT people. You may find that other advisers, mentors or trainers have an ‘understanding gap’ between how business works and what technology can do. Most people understand one or the other, but few understand both. We do. Cocreative will help you bridge this gap and enable you to become more successful as a result. Cocreative has been helping small and medium sized businesses since 2003. Along the way, we have developed many checklists and templates to save time in doing most of the tasks you need to do. Most are available free on our website. This gives you quick access to a wide range of useful techniques, and maximises the long-term positive impact of working with a business adviser/mentor. Our practical, workshop based, training programme is focussed on helping entrepreneurs develop their skills in running their businesses effectively with minimum disruption to your daily activities. If you want to know more about what we do, please have a look around the website. There’s lots of useful information like checklists for managers like you to look at. So what are waiting for? This may be the best investment you ever made. Email or text Jacqui now on 07739 488060 to arrange an introductory chat.